It’s my middle name. It’s my favorite feeling. And it’s said to be the emotion my mother felt when I was born. There’s two times of the year that I feel this emotion so much more than any other: My birthday… and Jesus’s Birthday. I adore Christmas. I love the reminder of God’s love. I love the decorations. I love Nativity sets. I love that the word ‘Joy’ is everywhere. I love that it’s an excuse to see family and friends. AND I LOVE PRESENTS. Both giving and receiving. Seriously, what a JOYFUL season. My incredibly supportive friends. The ones that laughed with me in the highs and cried with me in the lows. The ones that shared a meal with me. The ones that listened to me gush about a new boy. The ones that chuckled as I realized I was maybe a wee bit lactose intolerant. The ones that listened as I debated about moving across the country. The ones that told me to follow God’s path for my life. The ones that encouraged me to pray when I was unsure. The ones that packed a UHaul. The ones that brought coffee and treats for the trip. The one that helped me move and settle in my new home. And the new ones that have taken me under their wing and showed me around my new town. Netflix and HuluPlus. I get it. Some of you are early adaptors. You’re so cool. I wasn’t. But for someone without cable for the past 3 years… I must say… those are both pretty amazing and can bring a ridiculous amount of joy. My family. I love them fiercely. We may not be perfect, we absolutely have our moments, but their outpouring of love through change this year has been astounding. We had some crappy family stuff this year, but seeing my families band together was truly amazing. We invited someone new to our family meal table. We kicked brest cancer in the a$$. And when I called sobbing because my checking account was overdrawn, my brothers were there to bridge the gap. I am so joyful for each and single member and so blessed to be a part of such a strong clan. My house. Sure, it’s not in this town. But I spent 5/6th’s of my year there. I love that house. Pulling up in the driveway brings me joy. So does the fact that it’s now housing people who needed it. My new job. Waking up and being excited to go to work is such a blessing. My coworkers are incredible lovers of the Lord and have inspired me in so many ways. My boss it great. My boss’s boss is great. Every day brings a new level of joy at work. My apartment. Downsizing is possible everyone and guess what? It can be joyous. It’s prompted a whole new level of frugality. Do you need 400 t-shirts? Do you need 8 sets of bedding? How many bottles of shampoo can you possibly use in one years time? No use in storing earthy treasures. Yesterday, when I pulled up to unload everything from my trip home – some guy was cleaning his truck and blaring Jock Jams from the speaker while another (older) gentleman was yelling at him from the third floor to turn it down. Guess what? That sort of thing doesn’t happen in my old neighborhood. And I loved it. Joy. In. My. Heart. My special friend. It may be a year later, but I’m still getting introduced as his special friend. He makes me laugh, allows me to be fiercely independent, drives me insane and then puts up with my crazy. He’s great. And very private. So that’s that. Beyoncé. I’ve listened to her music on repeat for hours on end while driving back and forth between states. Yes I’m singing at the top of my lungs. It keeps me awake at 5am. For that I’m both thankful… and gets her on the joy list. And so many other things that seem trivial but make this year incredible. The concerts, the board meetings, the shopping trips, the road trips, and the adventures. I have a roof over my head, food on the table and plenty of clean water to drink. What a lucky girl. So to that – I’d say it was an abundantly blessed and joy filled year. I can only pray that 2013 will be half as wonderful, as incredible, as blessed and as joyous. My family is classier than your family. Hands down. I have four brothers and I love each and every single one of them fiercely. We’re silly. We’re loud. We sit on each other. And, if I do say so myself, we’re awesome. I go home for holidays and get so excited that we’ll all be together again. I love them. I loved living with them. Boys are great. And then I sit down and fall into the toilet because the toilet seat is up. And I remember how great living alone is. 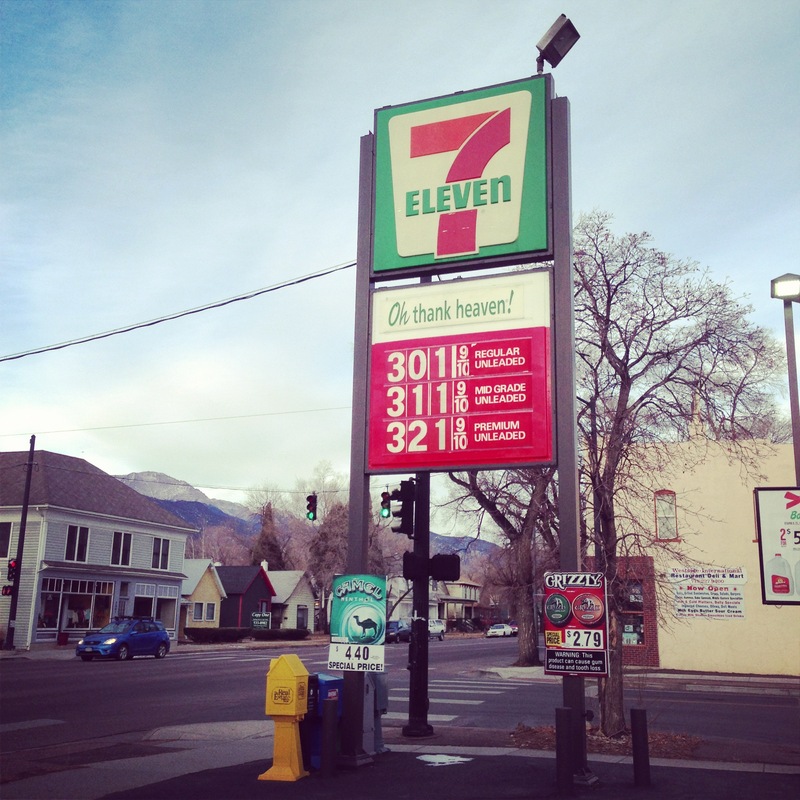 So here’s the funny thing about gas prices… a few cents can make or break your mood. Normally, I’m pretty easy going about the entire process. I won’t drive across town over $.05 cheaper gas, because I’m maybe filling 16 gallons and that $.80 savings just isn’t worth it. Now… driving home for Christmas and being on a budget… that’s another story. That’s 1100 miles… and that’s a whole 50ish gallons in my small SUV. On $.05 that’s only $2.50… but… My first drive out here was at $3.87 so when I saw THIS price today I was elated. Would you just LOOK at that number! $3.01?! You’re kidding me! That’s $.86 cheaper and that means $43. Forty-mother-flippin-three dollars back in my wallet. Stop it. Stop the maddness. And all happiness and joy immediately disappeared. Gas for under $3 a gallon. AND I MISSED IT? Stop. Santa whyyyyyyyyyyyyyy?! All the rationale of “Betsy this gas is only $.12 cheaper… you really only lost $1.44 because you only got 12 gallons” vanished. There was gas for under three dollars and I missed it… by a block! This frugality is new to me. And so is the anger that comes with the missed bargin. You’d better believe that I’m so pumped to drive eastward bound tonight to see all of my loved ones back in the great state of Nebraska. I’m so thankful that it’s Christmas time and I love that I’m working for an amazing organization that celebrates the reason for the season and had an actual Christmas party and not a holiday gathering. I can’t wait to drink egg nog and give gifts and sleep in flannel pajamas. Can I look past my anger in the name of baby Jesus and get over the amazing gas price that I stumbled upon too late? Most likely yes. But will I continuiously tell this story to friends and strangers alike for the next week? Absolutely. Here’s to safe travels to all… and to ridiculiously low gas prices! Now if you know me at all, you’ve probably heard me gush over my pets. I can’t help it. Some people gush over boys, children… but me? It’s my pets. Why? Well, they are adorable. Obviously. Meet Kate Spade (because she is, get it?) – weighing in at 95 pounds. She’s part Newfoundland and part mystery – the fun in rescuing a dog. Kate is a freight train covered in hair, the girls got some serious power and when I adopted her they said she was sassy. I thought “oh please, how could a dog be sassy?” Well. I’ve learned. The girl is sassy. This is what two days of shedding looks like in the spring at our house. Jealous? And then there’s Phoebe. Phoebe may be the most talked about cat I’ve ever known. Simply because she has a mustache. That and she’s been featured on the world famous Cat’s That Look Like Hitler website. Other names for Phoebe include: Phoebs, Hilter Cat, Kitler… Poor kitty, she hates the attention. I mean really, the girl has a mustache, how can you not love her? You’d better believe that both of these furry four-legged friends will be referenced in posts to follow – and I thought an introduction may help set the scene. So I apologize for the long post (ahem, Katie Becker), but it was completely necessary. Especially for this next story. Knowing this, I’ve never taken K to the dog park. Truth be told, it sounded like a complete disaster waiting to happen. K not on a leash + Lots of dogs + No way to catch her = Impending Doom. Now though, I haven’t been left with much of a choice. There are mountains all over and one million outdoorsy types surrounding me… people just do dog parks. It wasn’t until I’d found a seasoned dog park vet to agree to go with me that I even began to feel remotely confident that this could work. 1) Because he knew where the dog parks were and how they worked. 2) Because I was coming off of the high of a really great church service. 3) Because he assured me it would be fine. And it was. In fact, it was better than fine. We got there, we entered through the double gate, and after I removed the leash, K turned into the perfect dog. We walked along the path (because that’s what you do at dog parks? who knew!) and K followed along. Other dogs came into our path and she politely said hello and then continued along her merry way. There was a giant stream in the dog park, I told K no and she didn’t run into it. It was incredible. We had a ball. Shockingly, the best part of this story isn’t about K. It’s about my new friend Jared and his lovely dog Ranger. The secret dog whisperer. Just look at those dogs lining up to be his friend. You know that moment when you just know something is going to end poorly? Well, it was on one very strong throw of the frisbee by Jared that I realized I couldn’t see Ranger, but I could see a white and black blur coming from behind me. I braced. I bent my legs. I know the drill, K runs freight speed and knocks into me all of the time. I was prepared. However, I wasn’t prepared for the dog to hit right behind my knees. Causing me to buckle. Before you could blink, I was on the ground. My keys, phone and dog treats flew from my pockets. My headband came off my head (explain that?) and I was flat on my back. My reaction? To laugh. Hard. Because how could you not? Had Jared been a close friend, he would have laughed at me with me, taken a picture, and posted it everywhere. But sadly, Jared is a southern gentleman and that leaves me without any photographic evidence. Sigh. I feel like everyone complains of a full Pinterest board – but no time to try anything. Guess what folks? This girl has time. And plenty of it. So each week, I’m going to make/bake/cook something off of Pinterest. And I’m going to invite friends over to help me try it, because let’s face it, I absolutely can’t eat a whole crock pot full of enchiladas… and I love dining with friends (and their dogs, but that’s a blog post for later). This week, I was inspired by Liren and Roxana over at Roxana’s Home Baking Blog by the tempting and amazing potato pizza that Liren made for Roxana. Back home, my absolute favorite restaurant has a to die for potato rosemary pizza. I miss it like crazy and I thought this guy might be the solution to that craving. Bad news: I was reminded that no one can compete with the amazingness that is Bread & Cup. The pizza, the dessert, the simple salad, the wine, the friends… but I digress. Good news: thanks to Liren, I have a pretty tasty runner up! Preheat oven to 450 degrees and place an oven rack in the lower half of the oven. On a lightly floured surface, roll out the pizza dough to your desired shape, about 1/4 inch thick. Transfer the dough to an oiled baking sheet and press the dough with your fingertips, creating dimples and a 1 inch border around the perimeter. Take a cookie sheet, spray some cooking spray on the pan and roll your store bought dough out. Pinch the corners up about an inch to create the crust. Sure, it’ll be a rectangle, but guess what? It’s still tasty. Top with the cheese and potatoes. Brush the potatoes and the crust bordering the pizza with olive oil (turns out, if you don’t have a brush, a spatula will work nicely!). Season with salt and pepper, and scatter the thyme (or rosemary and walnuts!). Bake for about 15 minutes (mine took 25), or until the crust is golden brown and the potatoes tender. Remove from oven and let it sit for about 1-2 minutes before slicing. Serve it with a salad for lovely and simple dinner. I’ve owned a potato peeler for years. First time I’ve used it. There’s pride in that. Yes, it’s from a can. Yes, that’s the cheaters version. But guess what? It was delish. It was tasty, it was fairly easy (prep time 25 minutes, cook time 25 minutes), it was inexpensive (total cost for two pizzas: $11.95 – with extra potatoes and thyme) and got rave reviews from the five people it fed. I’m calling it a win and I’ve officially pinned it with positive reviews on Pinterest. So tell me, are there Pinterest projects/recipes that you’re dying to try? Let me know in the comments section and I’d love to add them to my weekly Pinterest Challenge board! I think one of the most incredible things about food is the power it has to bring people together. A meal is a wonderful way to spend an hour of your time catching up with an old friend, laughing with close girlfriends about your weekend adventures, or on a date with your special someone. Because no matter how much time you have… everyone has to eat. Grab a quick lunch, spend hours dining at somewhere special, whatever it is – I adore having a meal WITH someone else. Which, conisidently, is one of the strangest parts about moving somewhere new. You instantly cut out all of your dining partners. But what I’ve learned, if you’re cooking for one, you might as well cook for four… and asking people to join you for a meal is an amazing way to try out new friends (and inspire people to want to spend time with you)! So last night, I decided to go big or go home and invite people over for a meal. And my dining entree of choice? Frozen Runzas. Here’s the thing, if you know me, you know I adore Runza. It’s a Nebraska thing that I’ve always had a hard time describing – because – well – it’s a Runza. But all of my new friends had never had the pleasure and so I threw a bunch in the oven, got a few snacks and put on a Christmas movie. The best part of the night (besides finding out I did in fact have friends that would come over for a meal)? The reactions to the Runza. I would never have considered that as a description… but… it’s maybe not too far from the truth! I’ve always said I like life a whole lot. Because it’s true. I have an amazing family, I have the most wonderful friends and I am abundantly blessed by Jesus. I’ve always led a hectic life. The word ‘no’ has never been in my vocabulary. But even further than that – I thrive taking on new tasks. I love going on new adventures. I love meetings, boards, and spending time with people. I enjoy operating on a full schedule. I spring out of bed, conqueror the day without taking a break and crash into bed at night. Those people who have free time? I didn’t understand them. Not in the least. Until recently when my day after day crazy hectic life came screeching to a halt and my schedule became WIDE open after moving to a new state and leaving the familiar behind. With all this free time I was left to ponder, what do I WANT to do with my time? Not – what are you required to do this evening? Not – what obligations to someone or something do you have? But – what is it that you truly want to spend your time doing? As someone with a full plate, I’d never consider what I would do if I were handed free time. I finally had all the choice in the world, what would I spend my time doing? And I had no idea. None. Zlich. After a bit of soul-searching, I found that among my amazing and abundant blessings, there are a few areas in my life where I was less than blessed… Mainly domestic and mainly consisting of baking, cooking, cleaning… and organizing. But here’s the beautiful thing about free time. When you have time, you can spend an hour making a meal. You can take the extra time to color coordinate your closet. You can spend 5 minutes a day wiping off the counters. And suddenly, you’re an organized person. Do I still take my coat off and throw it over the chair in the dining room? Absolutely. Do I sometimes leave a pan in the sink overnight because I just simply don’t want to wash it? Of course. Because life is a journey. Why jump from complete chaos into absolute perfection? That can’t be right. I want to enjoy every step of the journey. I want to learn to bake. I want to enjoy making food. I want to find the absolute best way to organize my socks. And then I want to share it. All of it. With those that have less time. And for those that want to laugh at my missteps and my failures with me. Because even miles away from my home, I want to connect. I can’t promise it’ll all be funny. I can’t promise every post will be worth it. But I can promise it’ll be a heck of a journey!